Agriculture in Carroll County is a diverse industry including, livestock and milk production, grains, egg production, fruits, vegetables and more. The Carroll County Agriculture Extension Agents provide technical and educational information to county farmers to keep them up-to-date on current methods of production. Like us on Facebook! Follow us on Twitter! 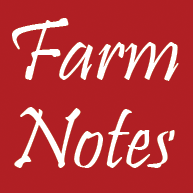 Keep up with Farm Notes!